These days if you can get 80 percent of people to agree that it’s raining outside even as they’re soaking wet from the downpour, it’s pretty close to a miracle. But there’s a piece of legislation that passed last spring and will be on the statewide ballot in November that has the support of nearly 100 percent of the legislature and 80 percent of the public. And if the referendum passes next month, it will benefit residents in cities and rural areas, and even bring more visitors – with their all-important tourism dollars – to Georgia. This legislative marvel is the Georgia Outdoor Stewardship Act (GOSA), which creates a dedicated funding source for land and water conservation – and here’s the near-miraculous part – it does it without raising taxes or fees. If the referendum passes, then beginning next year, up to 80 percent of the state sales tax already collected on the purchase of outdoor sporting goods and recreation equipment will be dedicated to conservation funding. That means it will be used for things like protecting drinking water supplies, conserving wildlife habitats, improving parks and trails, and maintaining state parks and wildlife management areas. It’s legislation that was six to seven years in the making, says Thomas Farmer, executive director of the Georgia Outdoor Stewardship Coalition, which includes The Nature Conservancy, Georgia Conservancy, The Conservation Fund, The Trust for Public Land, Park Pride and The Georgia Wildlife Federation – the group that came together to work with the legislature to craft the act. It may seem like a long time, but the hard work was worth it, Farmer says, because the result is an extremely popular piece of legislation. The funding source – equipment people already use in the great outdoors – also seemed like a no-brainer. Georgia is an outdoor enthusiasts dream – even our capital city is called the “City in a Forest” – and once outside the metro areas, we’ve got lakes, rivers, trails, parks and hunting grounds that are used by thousands of people every year. If we want our children and grandchildren to be able to enjoy the same outdoor experiences we have today, dedicated funding is needed, say conservation leaders. To help with planning, the legislation will dedicate an estimated $20 million each year for 10 years to conservation, with the option of renewing. These aren’t funds for personnel or raises or new vehicles – though all of those things are also important. No, these funds are for the “fun stuff,” Watson says. 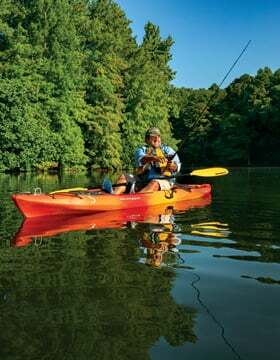 The words outdoor recreation may conjure up days spent in solitude – hunting, fishing on a quiet lake, anywhere with few other people around – but the legislation is equally important in the cities, says Michael Halicki, executive director of Park Pride, an organization that helps communities enhance parks and greenspace in Atlanta, DeKalb County, Tucker and Brookhaven. Those are some big goals – economic development, maintaining lands for the future – so how will it all happen once the referendum passes? The details are still being worked out in the DNR, but in general, organizations, state parks or community groups with a qualifying project will apply for funds and enter a three-step process. Once applications come in, then the legislation has defined a board of trustees that includes representatives from DNR, the Georgia Department of Transportation, the Forestry Commission and others. The legislation also includes a trigger that moves the money back to the general fund if state revenue drops below a certain point, he says. GOSA is not the end of conservation financing in the state. In fact, many leaders see it as just the beginning – a way to leverage grants to get even more funding. And in the cities, it can also bring communities – neighborhoods, businesses, existing parks – together. The bill is not just about land and parks; it will also impact water conservation. The key to water quality, he says, is having protected land around streams, lakes and rivers to preserve natural filtration and percolation of rainwater that ends up in those lakes and rivers. And in the cities, it’s all about quantity – getting as much water into the rivers through curbs and gutters. But still, that water needs to be filtered, so protecting lands around city waterways is important as well. “Those are just two basic examples at the highest absolute level of why this connection should be directly made between land and water conservation,” Ramsay says. With near 100 percent backing, organized opposition doesn’t seem to exist. But the question – What if the referendum doesn’t pass? – can’t help but come up. Vote Yes if you favor the proposed amendment. Vote No if you oppose the proposed amendment.